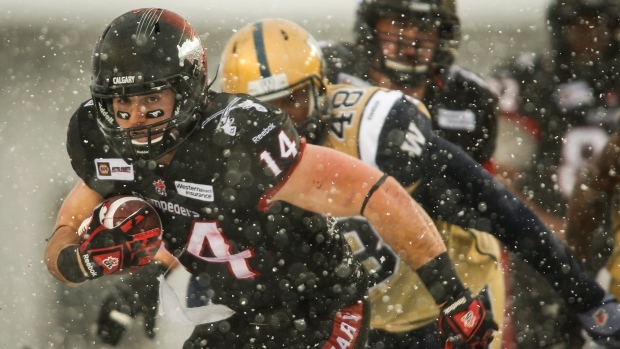 CALGARY - The Calgary Stampeders have signed Canadian running back Matt Walter to a contract extension. Walter had 453 rushing yards, two touchdowns, 11 receptions and 105 receiving yards last season, his third with the Stampeders. In the post-season, Walter had four carries for 16 yards in the West Division final and had one kickoff return for 27 yards in the Stampeders' 20-16 victory over the Hamilton Tiger-Cats in the Grey Cup game. "Matt has steadily developed and escalated his game ever since joining the Stampeders," said Calgary head coach and general manager John Hufnagel. "He has done an excellent job in his role and has stepped up and delivered when called upon as a starter. It's a tremendous asset to the team to have a talented tandem of Canadian running backs in Matt and Jon (Cornish) and I look forward to continued great performances at that position." Walter played at Calgary's Bishop O'Byrne High School and then starred for the University of Calgary Dinos before joining the Stampeders in 2012.